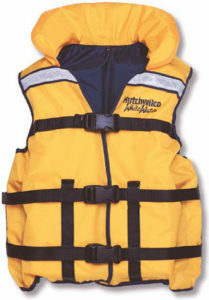 White Water safety gear is mandatory for all rafting expeditions for your group to remain safe. That 3,000 cfs of flowing water you are on appears to be gentle when you start, but it provides a hefty ride once the rapids begin. Each cubic foot weighs 62.4 pounds, so 3,000 of them add up to 187,200 pounds flowing by every second past rocks and falls. That’s the same as 20 or so elephants rumbling along. As long as you stay on their back you are ok, but don’t try stopping in their midst! When this flow of water is squeezed through a small area, it becomes much more violent and there is lots of whitewater as it tumbles over underground rocks. Always be prepared with white water safety gear such as a good PFD, safety ropes, glue, patches and pumps – all the things you need to put it back together if your plan goes wrong in the middle of a trip. Ensure that your white water rafting company has all of these things as well. It is a good measure of just how professional they are and how well prepared they are to make sure that you and your buds remain safe in any situation. Glue and patches suitable for doing repairs to your inflatable raft which is no longer inflated. Don’t forget a pump to help you re-inflate the raft once you have completed the patch. This can mean the difference between a long walk or having to wait until someone notices that you are not back in time. A Comprehensive Medical Kit contains everything you’ll need to deal with reasonable emergencies. Included in a zippered nylon bag are sections dealing with Wound Management, Trauma and Infectious Control, plus a selection of medical instruments. A kit should also have advanced versions of blister and burn treatments, oral re-hydration salts and diarrhea medication, plus a tube of Glucose paste, a liquid sugar gel for cases of low blood sugar. A medical guide book tells you what to do. A high-density ABS shell for durability, and dual density EVA foam lining for multiple-impact protection should always be included. On any river on any boat or raft your best friend is your Personal Flotation Device (PFD). A human PFD must be Coast Guard approved – snug so it can’t be ripped off or ride up and interfere with vision when in the water. Type III PFD’s, favorites for whitewater, are comfortable, stylish, and colorful. Flotation is a minimum of 15.5 pounds. Type V PFD’s are rated for commercial use, have a minimum of 22 pounds of flotation, use straps with buckles instead of zippers, have a flotation collar behind the head and adjustments to fit a wide range of wearers. And don’t forget your dog’s PFD. Although natural swimmers, dogs find it hard to swim in whitewater and need extra flotation, too. Pullies for making it easier to haul things over rocks and through the water, a whistle for communicating, oval carabiner’s and water proof bags to keep things like matches and flares dry. There are a variety of knives to choose from. Choose a rugged, strong knife that can be used to cut rope and shave shavings to help start fires. An easy lifeline that will do triple duty is a 100′ length of 1/2″ Blue Water Rescue Rope. A waterproof bag has a sealed opening and closing system for easy access and re-packing. Everyone figures their cell phone will work every where. Unfortunately there are many places in the wilderness were cell phones do not work. Rent a satellite phone for the trip to make sure you have a lifeline back to civilization in case you need help! Always tell someone were you are going and when you expect to be back. Stick to the plan, because if you do have an accident and need rescue, the first place they will look is on the river you planned to go on. If you end up somewhere else, no one will know were to look. Feel free to leave comments on our blog. Spam comments will be deleted.